I like to can my own food for a few reasons. 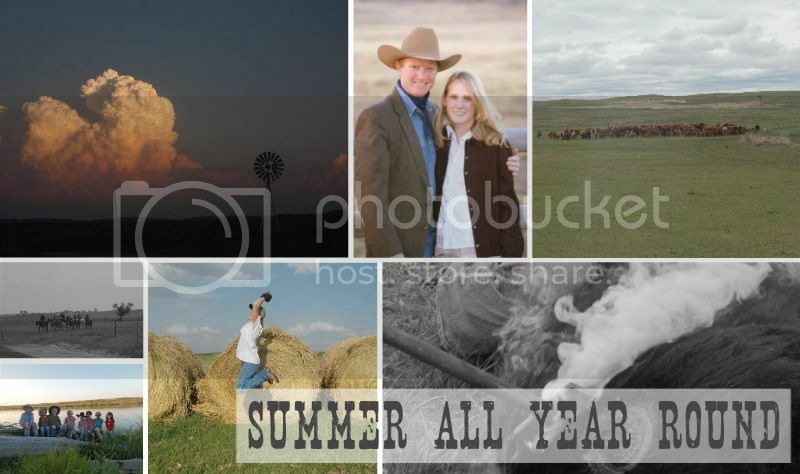 Number one: I LOVE being self sufficient and seeing the fruits of my labors on the table. Number two: I like knowing where my food came from, what's in it and how it was prepared. 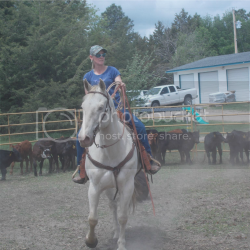 Number three: I want my kids to know where food comes from and the work that goes into it. It's way too easy these days to stop off and get fast food. Most people don't have a clue about where their food comes from, or what it takes to get it to them. Number four: I don't know if it's less expensive or not. I know the jars are an investment and at this point I don't care. If my food is more natural and less fake, I feel better. Start reading labels and you will see how much fake food our society eats. That tricks our body into craving it, and makes us overweight. Ok, I'm off my soap box. I mainly do it because it makes me feel good inside to see my pantry lined with stuff I grew and preserved. 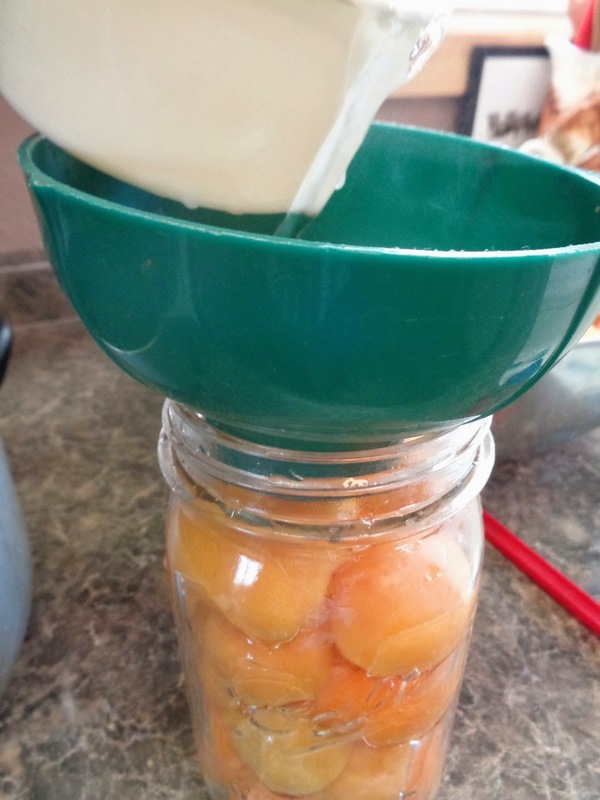 So here's how to can apricots. 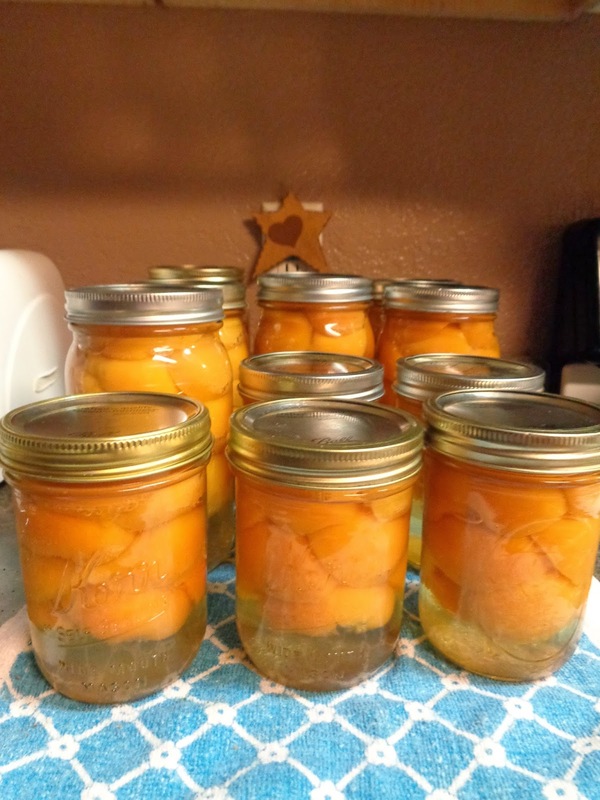 They are much easier than peaches or pears because there is no peeling required. Fill one side of your sink with cold water to wash the apricots in. Use the other side to wash and rinse the jars. 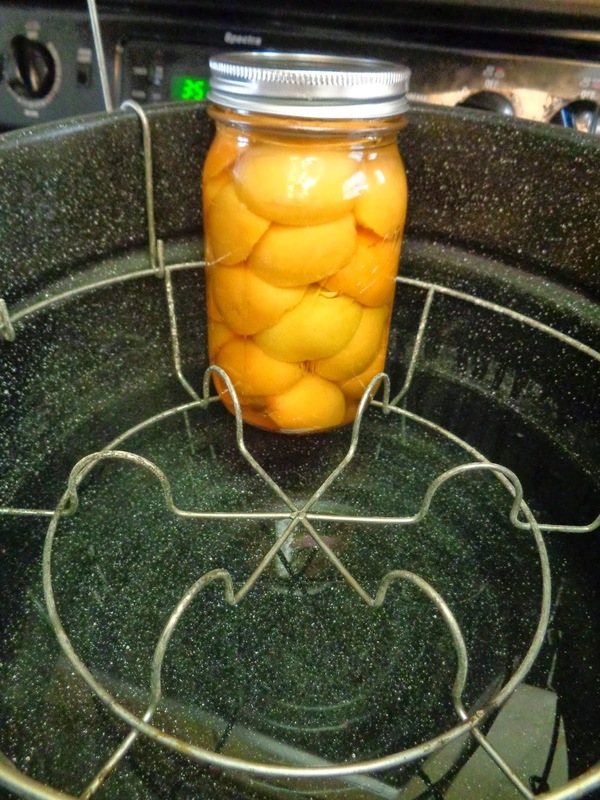 Then fill the jars and the sink with hot water to keep the jars hot before putting the apricots inside. Mix up your syrup over medium low heat. Then turn to low to keep warm. Throw your lids in the small pot over low heat. You don't want it to boil, but almost a simmer. Fill your large bowl a little over half way with cold water and add some good shakes of the fresh fruit. How do you know if it's enough? If your fruit starts to brown, add more. Fill your canner half full of hot water. 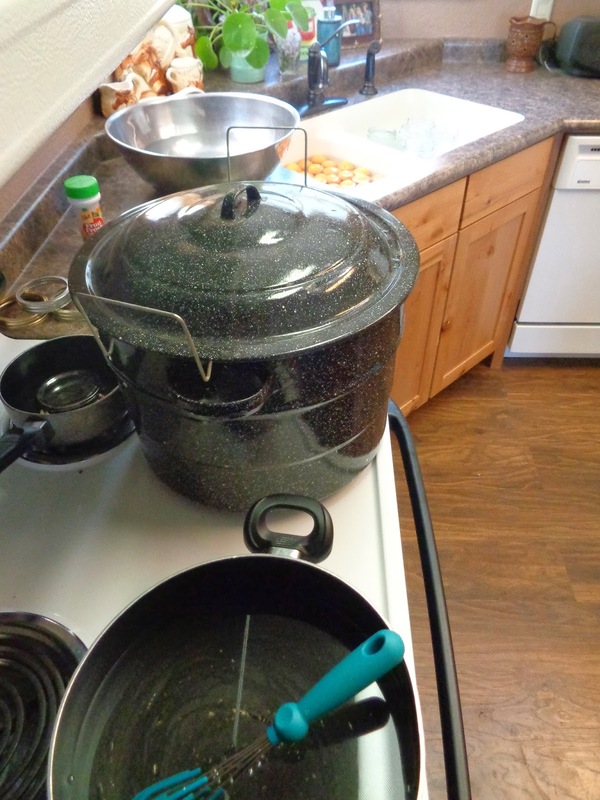 Here is the set up, starting at the bottom of the picture: Hot syrup, canner over medium hight heat, lids, bowl of produce protector in water, apricots and jars in sink. Most of the work is just the preparing your work space. It's a piece of cake from here. 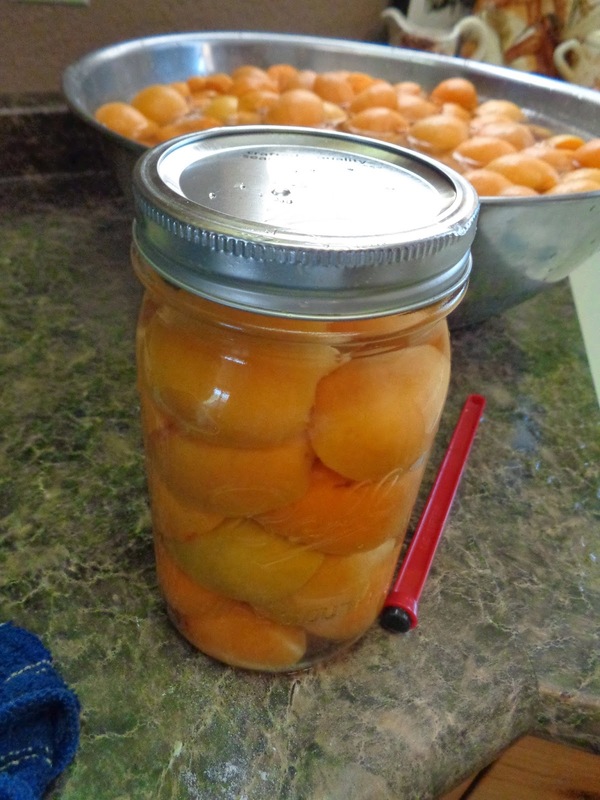 Pull the apricots in half staring where the stem was. Take the pit out and put the fruit in the bowl of water with produce protector. 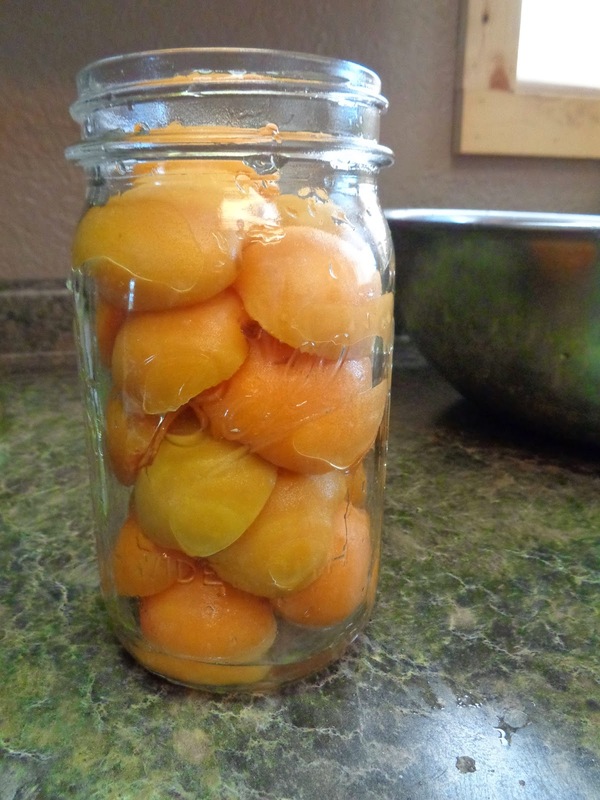 Remove and empty a hot jar from the sink, fill with apricots, cavity side down. Using your jar funnel and a measuring cup, pour in the syrup, leaving 1/2 inch of head space and covering the fruit. Wipe the jar rims with a clean damp cloth. I found this nifty tool, but it needs a stronger magnet. Get your hot lids and stick them on your jar rims. Add the band or ring, whatever you want to call it, and tighten. Tighten good, but not too much. Place the jar in the canner. Repeat. Put the next jar on the opposite side so as to balance things out. Now lower the rack into the already hot water. Put the lid on the canner and turn the heat up to high. When it comes to a rolling boil, set your timer. Quarts 30 minutes, pints 25 minutes. When they are done, turn heat off, remove lid, set timer and allow to cool for 5 minutes. Then, using this tool, remove hot jars from canner. Put on a towel and cool completely. There you go! That wasn't too hard. Now you'll find yourself opening up your pantry just to look at your canned goods!